FarmHop, the Northwest Indiana Food Council’s showcase of farms and gardens was on the road Saturday. From East Chicago to Michigan City, south to DeMotte, bus tours of 19 growers who think outside the box, believe small is big, grow in season and sell local. 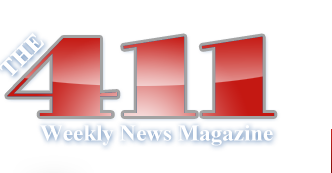 Most of them practice soil conservation methods, avoiding pesticides and chemical fertilizers. Divided into 5 tours, visitors saw an aquaponics system growing vegetables and herbs, urban farming methods, community gardens, traditional farms, a fish farm, and a high school farm operated by students. 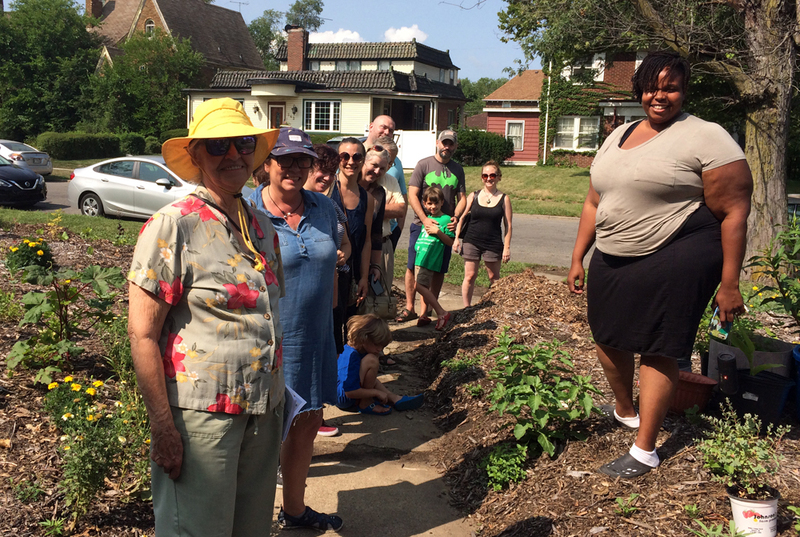 At Sojourner Truth House, a shelter for homeless women and their children, they saw a vegetable garden that helps to feed 30 to 100 people a day. A year ago, it was a grassy plot beneath a shade tree. 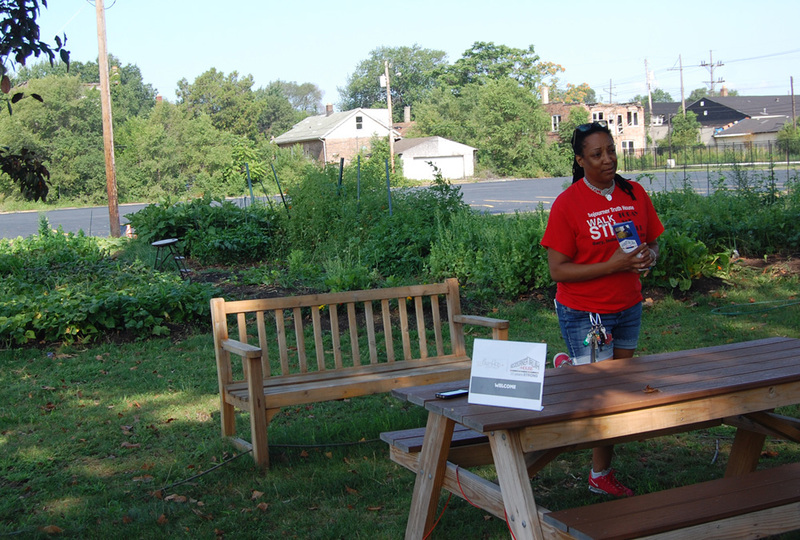 Arleen Peterson, STH operations manager credited a group of “dedicated volunteers who wanted to help Gary” for the garden’s bounty of tomatoes, greens, cabbage, cucumber, squash, onions, and more. The garden has impacted all at STH. Peterson said the cook has had to learn to include the garden’s harvest. “Every day we have a salad. Clients have learned to love swiss chard,” she said. “We want our clients to know that once they’re situated, they can have a garden.” STH has a share box for unused harvested vegetables; they are available to staff and community residents. For Aja Yasir, a lush green lawn is a waste of resources. 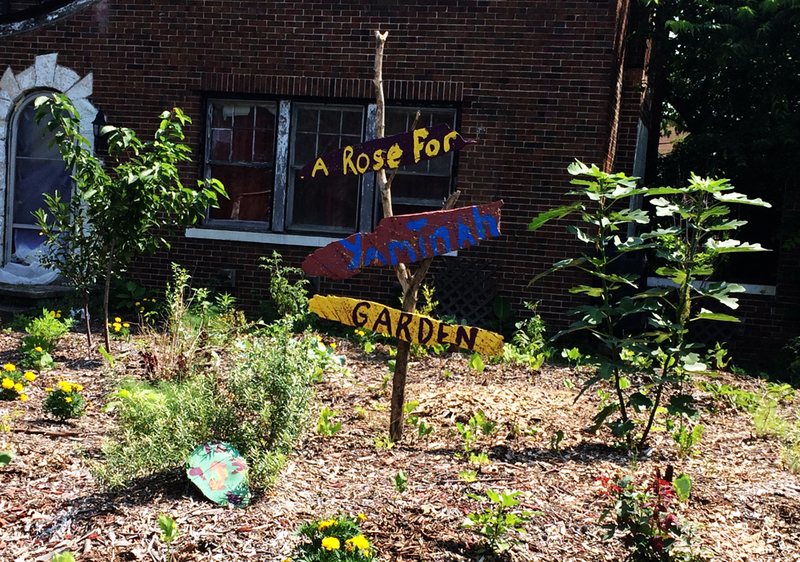 Yasir has converted the front yard of a house she and her husband are rehabbing at 541 McKinley Street in Gary’s Horace Mann neighborhood to “A Rose for Yaminah,” a growing space for dozens of edible and medicinal plants. The garden is a tribute to her daughter Yaminah, who passed two years ago. Yasir amazed the FarmHop visitors with her tips. One of them, add a bit of molasses to water to help nourish the plants. Yasir fights garden bugs and pests with herbs like peppermint, chives, rosemary, and oregano. Instead of city water, she captures water in a rain barrel. Her garden is layered with woodchip compost. She said the chlorine in city water kills the organisms in the compost that plants need to grow. Yasir also totes water from the canoe launch at Marquette Park because it has nutrients from the fish and seaweed that help nourish the soil.